28 May 2018 — Thai Lawyers for Human Rights (TLHR) today submitted a letter of complaint to three United Nations special procedures urging that they intervene into the case of 15 activists arrested on May 22, 2018 for assembling to call for a democratic election in Thailand. In the letter, sent to the Special Rapporteurs on freedom of assembly, freedom of expression and human rights defenders, TLHR said that the arrest and charging of the 15 activists after they assembled at Thammasat University constituted a breach of Thailand’s obligations under the International Covenant on Civil and Political Rights. The Bangkok-based human rights legal group, which was established after the 2014 coup to fight for the rights of accused people under military dictatorship, called for the UN independent experts to make an urgent intervention into the case of the 15 so that the charges against them are dropped without delay. The case presented “an opportunity to address the deep and long-lasting negative consequences of military dictatorship in Thailand for rights to freedom of peaceful assembly and association,” TLHR said in the letter. 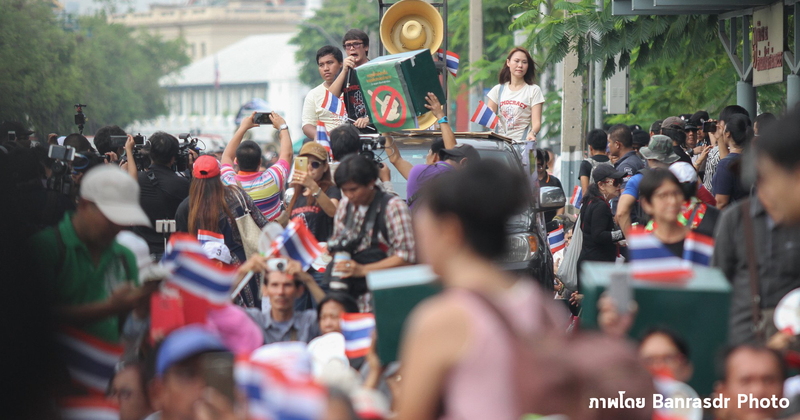 “Noting in particular that in this instance the human rights defenders had assembled to call for a democratic election within the year as promised by the NCPO,” the group pointed out that in 2013 the Special Rapporteur on freedom of assembly had made a report on concerns about the exercise of the rights to freedom of peaceful assembly and of association in the context of elections. TLHR called for the UN to “urge the Government of Thailand to keep its promise to hold a free, fair, credible and inclusive election within this year so that the country might be returned to democratic rule without further delay and the citizens of Thailand be able to enjoy rights to freedom of assembly, association and expression in accordance with the vision of the Universal Declaration on Human Rights”. It also urged the UN experts to call on the government to stop using and revoke repressive laws and orders that deny the rights of freedom of expression and association of people in Thailand.